The frame alone goes for €2,822.58 with a RockShox Super Deluxe shock, or €3,064.52 with an EXT Arma coil shock. Complete bikes start at €4,677.42, and go up to €5,982.87 for the EN model tested here. Highlights of our test bike's build kit included a RockShox Lyrik RC2 fork, Super Deluxe RCT shock, SRAM Code RSC brake, and Mavic DeeMax Pro wheels shod with a Maxxis Minion 2.5” DHF and a 2.3” DHRII. Construction and Features Unfortunately for all the armchair weld examiners out there, there's nothing to critique on the Machine. In fact, there aren't any welds at all. 7075 aluminum has a very high strength to weight ratio, especially compared to the 6061 alloy that's often used for mountain bike frames, but it can't be welded. To get around that fact, Pole CNC machines each side of the frame from a large billet, and then bonds them together with an aerospace-grade glue. The glue is said to be strong enough on its own, but the frame is also bolted together for extra security. This manufacturing process set the Machine apart from other aluminum-framed bikes, and although it's not as efficient or cost effective as going the tried-and-true welded tube route, it does give Pole the ability to quickly change the bike's design at a moment's notice. The Machine's shock positioning bears a resemblance to the Orbea Rallon and Specialized Stumpjumper, but there's a difference – the frame is asymmetrical, with the shock mounted on the non-drive side of the swingarm. That allowed Pole to increase the amount of room available for seat tube insertion so that riders can run longer travel dropper posts. The swingarm also has clearance for up to a 2.8” tire, which also means that there's plenty of mud clearance with a more typical 2.3 or 2.4" tire.Pole went with external cable routing, with the brake, derailleur, and dropper housing seated neatly on a shelf that's machined into the top of the downtube. That housing is secured with zip ties that pass through the frame, which seems clever, but in reality creates more of a hassle than the typical external routing setup. It takes a little extra fiddling to get the zip tie to pass back through the frame – in the heat of the moment, especially during a race pit stop, I could see it causing some cursing. There's no shortage of water bottle mounting options on the Machine – if you have a ride planned deep into the desert you can carry up to three bottles (two inside the front triangle, and one on the underside of the downtube). Geometry & Sizing Pole was one of the early adopters of truly long and slack geometry, and that trend continues with the Machine. Other larger manufacturers have started to hop on the bandwagon, but Pole still remain on the cutting edge. The 63.9-degree head angle, 480mm reach (size medium), and 455mm chainstays add up to give the Machine a whopping 1305mm wheelbase; for reference, that's longer than a size XL Yeti SB150 (1277mm), and just 10mm less than the length of an XL Santa Cruz V10 29. The seat tube angle is also very steep at 79-degrees. That's the effective angle, but the actual angle is plenty steep as well at 78-degrees. Taller riders shouldn't have any trouble finding a Machine that fits - the XL has a reach of 535mm, and a top tube length of 662mm, although it might be tricky finding a rack that'll hold a bike that long. The Machine uses Pole's Evolink suspension layout, a dual-short-link design where one of the links rotates around the bottom bracket. The bike's leverage ratio begins at 3:1 and ends at 2.2:1, providing enough progression to allow it to work with either a coil or air shock. The Machine's anti-squat value at 30% sag in the 32/50 gear ratio is 105%, which falls off quickly as the bike goes through its travel in order to keep the suspension active and responsive during larger impacts. Climbing It seems like all of a sudden everyone is clamoring about the merits of steep seat angle, a topic that was barely mentioned a few seasons ago. It's not all hype, though; steeper seat tube angles do have merit, especially on bikes with longer reach numbers. What's the point? Well, if you give a bike with a long front center a slack seat angle there's a good chance the handlebar will feel too far away, almost like you're trying to steer a car from the backseat. A steeper seat angle helps counteract this sensation because it moves the rider forward into a more centered and upright position. Pole was one of the early adopters of this geometry trend, and the Machine has one of the steepest seat tube angles out there, at 79-degrees. There is a limit to the madness, though and I'd say that the Machine is toeing the edge of just how steep things can get. Any steeper and the cockpit would have felt too short for me, despite the bike's sprawling wheelbase, and my knees would have been too far in front of the pedal spindle. Luckily, Pole stopped just before going past the limit, and the result is a bike with a very upright, comfortable pedaling position. That position meant my body weight was already where it needed to be on steep climbs, which meant there was no need to stand up or keep scooting further forward on the saddle in order to weight the front wheel. The slack head tube angle and long chainstays play a role here as well, providing extra stability on the climbs as well as descents. The shock also stays remarkably unaffected by pedaling forces - I never felt the need to reach down for the blue compression lever.The Machine is calm and composed when faced with technical climbs, and as long as I was able to keep putting the power down there wasn't much that could stop its progress. Not surprisingly, it was on slower speed, really tight sections of trail where the Machine felt out of its element. In those instances, it took more effort to muscle it around, a reminder that it's more focused on bombing downhill than darting up a tricky climb. There's also the fact that it weighs 32.5 pounds, which is reasonable considering the bike's intentions, but it's also a couple pounds more than bikes like the Yeti SB150 or Scott Ransom. Weight's not everything, but it is something to keep in mind. Descending The Machine is the mountain bike version of the gigantic snow plows they use to clear high mountain passes, the ones with two blades that can take care of both sides of the road at once. Sure, you can still bunnyhop over obstacles and manual through rollers if you want, but those maneuvers take a little more work to achieve. Instead, it's better to relax and let the Machine do its thing. This is the kind of bike where you can let off the brakes and trust that everything will be all right – it delivers a level of composed stability, especially in steep terrain, that's more typically associated with a full-on downhill bike. There's no hiding the fact that this is a big bike, one that's best suited to burly terrain and higher speeds (the 1305mm wheelbase makes the Machine the longest bike I've ridden to date), but I never felt out of my comfort zone aboard it. The combination of the 455mm chainstay length and generous reach creates a bike that's incredibly well balanced, one that doesn't require any dramatic position shifts in order to weight the front or back wheel.That being said, the long chainstays do make wheelies and manuals more difficult; the Machine would rather stay on the ground and punch through everything in its path rather than bounding daintily down the trail. Small jumps and bunnyhops are also a little more challenging, but bigger, bike-park style jumps aren't any trouble at all – in those instances, it's easy to imagine that you're on a downhill bike.The 180mm Lyrik deserves some of the credit for the type of antics that the Machine encourages, but the 160mm of rear travel is also very well managed by the Rock Shox Super Deluxe. There's enough support for pumping the ground to gain speed on smoother sections of trail, with a nice gradual ramp for dealing with bigger impacts. A coil shock would also be a good option for riders seeking the maximum of small bump compliance and traction, although there wasn't any lack of grip, even on slippery winter rides when the rocks and roots were extra greasy.Eagle-eyed spec checkers will have noticed that the Machine comes with a 51mm offset fork, rather than the 44 or 42mm of offset that's starting to become more common. You could certainly run a reduced offset fork, but I didn't encounter any handling issues that would have made be consider going that route. In my experience, the difference between offsets is less noticeable with slacker head angles. I also think there's more hype around offset than there needs to be, but that's a topic for another time. For now, just know that the Machine handles very well in its stock configuration. How does it compare? The Machine doesn't really have that many direct competitors, but it's worth taking a moment to compare it to a bike that's designed with the same intentions in mind – the Scott Ransom. Yes, the Ransom's made of carbon fiber, but it was designed with the same goals that fueled the creation of the Machine – to be able to handle the nastiest of trails while also remaining pedalable. Both bikes fall into the long travel 29er category, but they behave quite differently out on the trail. Climbing: The Ransom's seat tube angle is 4-degrees slacker than the Machine's, which gives it a more 'traditional' feel when climbing; the riding position is a little less upright, which puts my weight is a little further back towards the rear axle. In a perfect world, I'd split the difference between the two – the Ransom's seat angle is just a bit slacker, and the Machine's is a little steeper than I'd like. Of course, there's a reason seats can be slid forward or backward, and I can find a comfortable pedaling position on both bikes. The Ransom is 2.5 pounds lighter than the Machine, which is a significant difference. I'm more likely to grab the Ransom for longer, more pedaly rides, while the Machine gets the call on days that are more strictly focused on the descents. 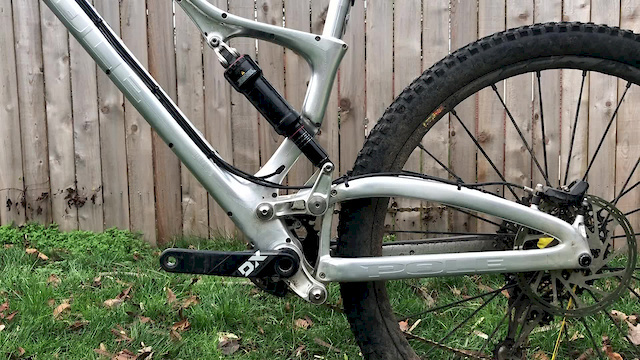 As far as actual pedaling performance goes, if both bikes are ridden with their suspension in the fully open setting, the Machine's higher level of anti-squat means that it has less bob and a more efficient ride feel than the Ransom. That being said, the Ransom's handlebar mounted TwinLoc remote is there for a reason, and all it takes is a push of a lever to bring its performance in line with the Machine. Descending: The Machine takes the win when it comes to straight-line speed and stability – the long chainstays and sprawling wheelbase make it feel incredibly planted and unflappable no matter how quickly the world is rushing by. The Ransom may have 10mm more rear travel, but the Machine's handling is closer to that of a DH bike, and it has the edge as far as pure monster trucking goes. At more reasonable speeds, the Ransom is easier to handle; it takes less effort to air over obstacles, and it's less work to navigate twistier sections of trail. Both bikes offer excellent traction in loose or wet conditions, but the Ransom's rear suspension feels slightly more supple off the top. Racing: How about as an enduro race bike? Which bike is best? That's a tough one to call, and it'll really depend on the rider and the track. Personally, I'd be inclined to go with the Ransom, due to the fact that it's easier to handle on tighter and flatter tracks. But for somewhere like Whistler, or any of the more gravity-oriented stops on the EWS circuit, the Machine would be an excellent pick. Mavic Deemax Pro wheels: The Deemax wheels remained true for the duration of testing, and have a very nice ride feel, although the freehub did emit a few more popping noises under load than I would have liked. Everything was in good shape when I pulled the freehub apart, but it's worth mentioning. The wheels worked well with the 2.5" / 2.3" tire combo on the Machine, but riders who plan on running 2.6" or wider tires may find themselves wishing for a rim width greater than 28mm. Huck Norris inserts: Huck Norris foam inserts are included in both tires, something that pinch flat prone riders will be happy to see. RockShox Lyrik RC2: The 180mm Lyrik complemented to the Machine's ride-over-anything manners very nicely. Once I had it set up I didn't need to give it a second thought - it performed perfectly on every ride, with good small bump sensitivity and plenty of support for bigger hits. Is this the bike for you? The Machine is about as close as you can get to a pedal-able downhill bike - it's a true monster truck in the best way possible. Pro-level skills aren't required to have a good time, but keep in mind that it feels the most alive at higher speeds and on steeper terrain. Pole have always done things a little differently than the big players in the mountain bike world, and that trend continues with the Machine. It's a bike unlike anything else on the market, and that sentiment applies to the construction technique and the ride characteristics. Pole's long and slack geometry numbers may no longer look quite as radical as they once did, but that doesn't make the Machine any less formidable out on the trail. For riders in search of something out of the ordinary, a bike that takes away any equipment-related excuses for not being able to get down a gnarly descent, the Machine fits the bill. Cooper Webb becomes the first two-time winner this season and takes over the red plate. Racer X's Jason Weigandt breaks down round four of Monster Energy AMA Supercross.